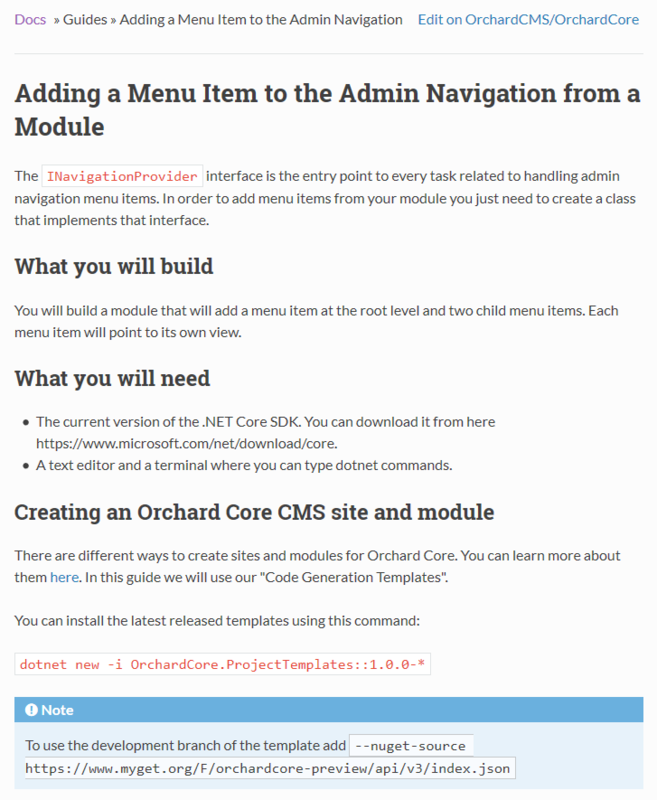 Two weeks ago we talked about a new section called Guides has been added to Orchard Core documentation. Till now there was only one getting started guide in the Guides page, where you can read about how to run tasks on application startup from a module. Now it's time to introduce the second getting started guide about how to add a menu item to the admin navigation from a module. 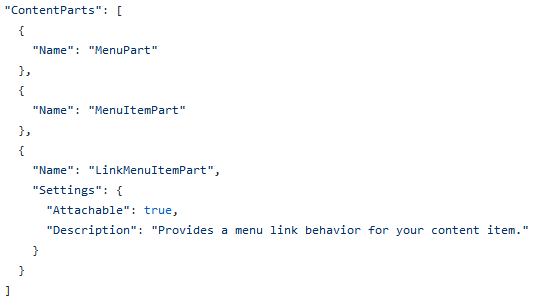 By following this guide you will build a module that will add a menu item at the root level and two child menu items. Each menu item will point to its own view. When we push a new changeset to Orchard Core's GitHub repository, the CI builds and redeploys new NuGet packages every time. As you can see, in the last few days we have lots of changesets containing only documentation changes. From now if Travis can't find any change that is not in an .md file/mkdocs file or in the docs folder, then ignores the build, because there is nothing to build, only the documentation has been updated. Same thing for AppVeyor, but in a different way. In this case, we say skip everything that is not in an .md file/mkdocs file or in the docs folder. Let's see an example of this behavior in GitHub. This PR is about to fix a minor typo in the HTML escaping section documentation of OrchardCore.Liquid. The sentence "If you need to render some raw HTML chars you can use the `Raw` filter." was wrong, because here you need to use the raw filter instead of Raw. If you click on the View details button near the merge commit, you will see only 2 checks. The AppVeyor one doesn't appear here and Travis just only has one step, that detects there are no changes and it will do nothing. 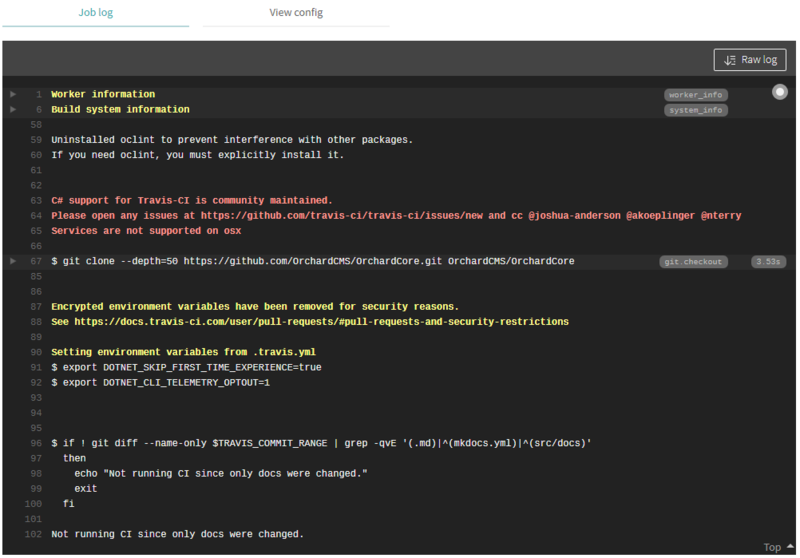 If you check the Job log of this build in Travis, you will see the message: Not running CI since only docs were changed. Now it will be faster if we do just documentation changes. It's common to upload .svg files and now you can upload .svg by default. This is to actually describe the parts as available. They were used, but not declared in the system, so you won't see them in the list of available parts. Now it's working and it's also has a description. You can find the new changes in the menu.recipe.json recipe. If you visit the Localization page in ReadTheDocs you can see a badge under the Online translations header. If you click on that badge you will be redirected to the Crowdin page of Orchard Core. How to work with PO files in Orchard Core? The Crowdin page contains all the entries for the languages which we had in Orchard 1.x. Now people can start translating Orchard Core! The files are organized by modules to make you easier to find the text that you want to translate. The next thing is to provide a guide about how to download the .po files and work with them, but it's fairly easy: just select a translation, hit the button with a black cloud icon near the Translate all button to download the translations in a ZIP archive. You can put the .po files from the archive in the Localization folder of the App_Data and then you should enable the given language in the dashboard to pick up the files. Oh wait, the documentation about installing localization files are up now? 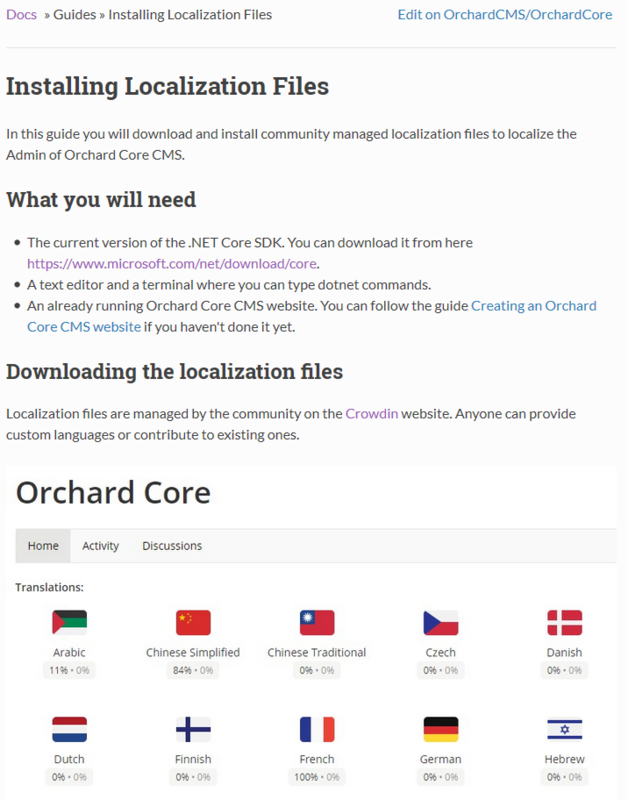 Yes, the third guide is up, so now nothing can stop you to add your first language to Orchard Core! Now we have 53 subscribers of the Lombiq's Orchard Dojo Newsletter! We have started this newsletter to inform the community around Orchard with the latest news about the platform. By subscribing to this newsletter, you will get an e-mail every time when a new post published to Orchard Dojo, including This week in Orchard of course.